→Vitamix Containers Explained – Which One Should You Choose? Vitamix Containers Explained – Which One Should You Choose? Vitamix containers come in different sizes and styles, so how do you decide which one is right for you? If choosing a blender isn’t challenging enough already, picking the right jar, large or small, can also be quite confusing. They range in sizes from 32 oz to 64 oz. Then there’s also dry and wet containers, not to mention low profile and classic Vitamix containers. Let’s go through all of these different types of jars and their pros and cons, so you know which one is most suitable for your personal blending needs. Dry containers are specifically designed for grinding dry foods such as coffee beans, seeds, nuts and whole grains. For example, instead of having to manually knead dough before baking, you can use a dry Vitamix container to take care of this process in a quick and easy way. Wet containers (the usual containers) are typically designed for blending, juicing, food processing and also for preparing hot meals such as soups and gravy. Wet containers are designed to create smooth blends. The left image below shows the blades of a dry grains container and the image on the right shows the blades of a wet container. You can see that the blades of the dry one have two squared off tips whereas the wet blades have four pointed tips. Wet blades are designed to blend things together which creates a beautifully smooth texture. Dry blades on the other hand are designed to push the dry ingredients away from the blades so that things don’t get clogged up at the bottom of the container. What Are Low Profile Containers? Low profile Vitamix containers are designed such that they can fit under the kitchen cabinet. One of the classic “frustrations” with Vitamix blenders was that they couldn’t be placed under kitchen cabinets. The containers were simply too tall. The fix? A low profile jar with a more compact design. Low profile containers are not necessarily smaller in size, they are simply lower than their classic counterparts. The low profile jars still have a 64 oz capacity, but they are much wider. This is very convenient when you blend on a regular basis and want to place your Vitamix blender right on the kitchen counter under the cabinet. Luckily my kitchen cabinets are high enough so that I’ve never had to buy a low profile container. But I can certainly understand why people would choose to go for a low profile jar for that specific reason alone. The word plastic is often associated with poor quality but that’s not always fair. Vitamix containers are made with rock-solid, BPA-free Eastman Tritan Copolyester, which is essentially plastic. People often ask why Vitamix containers are not made with glass. Because glass is naturally more durable and doesn’t contain any nasty chemicals, right? While that may be true to some extent, plastic is actually by far the better choice for manufacturing blender containers. Glass containers are very, very easy to break. You can drop them (yes I have dropped my Vitamix container several times) or you can simply hit them against another kitchen appliance that was not supposed to be there; they will eventually break. Glass containers are also a lot heavier which can be quite inconvenient. The plastic Vitamix containers are BPA free, extremely durable and very lightweight. Here is a list of all the different types of Vitamix containers currently available. It also mentions compatibility with Vitamix blenders, so you can be sure the container you’d like to buy actually fits on the blender you already have in your kitchen or are planning to buy. At the very end I’ve also included the containers from the Vitamix S-Series blenders. They’re a special kind of containers that are not compatible with any of the other containers (such as the C- and G-series). 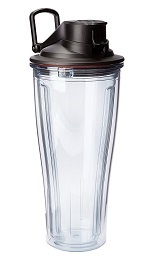 Blenders in the S-Series, or Personal Series, are blenders similar to the Ninja and Nutribullet models. They come with smaller jars (40 and 20 oz) and detachable blade bases, which is ideal for on-the-go green smoothies. All Vitamix containers are designed so that they will never leak anything into the motor base. This is very important because that type of leaking is the biggest cause of failure in cheaper, lower quality blenders. All containers also come with a clever spill-proof spout allowing you to serve your blends without spilling. Very useful! The most basic Vitamix container is the 32 ounce wet jar. The quality is just as good as any other Vitamix container, but the 32 oz version is simply a bit smaller. Just like with any other Vitamix containers, cleaning is very easy. A drop of dish soap with warm water is all you need and the blender will clean the container all by itself. This 32 oz jar is perfect for quickly preparing small batches of green goodness on the go, or dressings, frozen dessert and nut butters. Another benefit of a smaller sized container is that the blades are easier to reach and therefore easier to clean and dry. The 32 ounce dry grains container has the same dimensions and capacity as the 32 ounce wet container, but this one is specially designed for grinding whole grains into fresh flours and mix batter. The blades in this container are designed such that they push away dry ingredients so that the motor doesn’t get blocked. They can simulate the – otherwise manual – kneading process to prepare dough for baking. So if you enjoy making your own bread for example, this affordable container could be a great solution. Keep in mind that the dry grains container isn’t really suitable for creating green smoothies or other blends so you’re limited with what you can do with this jar. If the 32 oz container is just a touch too small, this 48 oz container is a great step up. While the 48 oz is a bit higher than the 32 oz container, it’s still significantly lower than the the classic 64 oz and would fit under most kitchen cabinets. This 48 oz container is perfect for preparing medium sized batches of smoothies or soups for small families. As the name suggests, the Classic 64 oz container is the most common Vitamix container that most Vitamix blenders come with. Standing tall at 13.4 inches, the Classic prepares is able to prepare large batches but likely won’t fit under the kitchen cabinet. 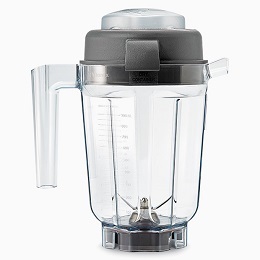 Also note that the Classic 64 oz is not compatible with the newer and more expensive G-series Vitamix blenders. 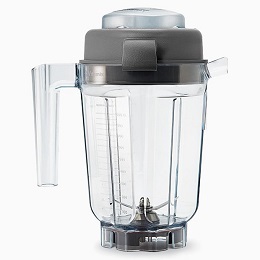 For a blender from that range, you’ll need to use the low profile 64 oz container. The low profile 64 oz container was designed for G-series, 5300 and 6500 Vitamix blenders. 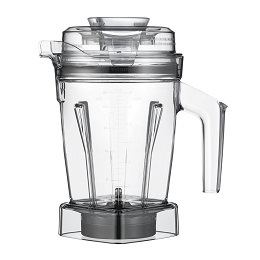 The popular Vitamix 5300 blender is actually the successor to the 5200 that comes with a classic 64 oz container. Just like the other Vitamix containers, the 64 oz low profile is clearly marked with ounces and cup measurements. This 10.1 inches high container is considerably lower than the 63 oz classic but they can both hold just over 2 liters of liquid meals, perfect for families. 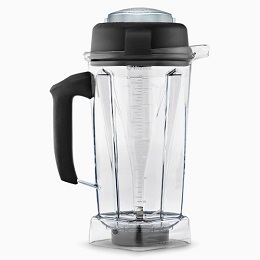 The brand new Vitamix Aer Disc (patented) container is a different kind of container in the sense that it acts very much like a muddler and cocktail shaker. Rather than blending the ingredients into a liquid substance like a traditional Vitamix container does, the Aer Disc container is good at muddling, whipping, foaming and emulsifying ingredients. The blades in the Aer Disc are basically circular and oval cutouts, which help to abstract juice and oils from the ingredients you place in. This is the perfect solution for creating things like cocktails, dressings and sauces. The Aer Disc container is available in a 48-ounce size only and is made from BPA-free Eastman Tritan Copolyester. As with most other Vitmaix containers, it also comes with a tamper to press ingredients down toward the disc blades. One of the reasons I’ve always been such a fan of Vitamix is that they’re blenders have always remained so old-school. The design, the features, Vitamix blenders typically look quite basic on the outside, but they are super robust. The quality is simply unbeatable. With the new Ascent series, Vitamix is trying to go with the times. Fancy looking machines with very modern features. 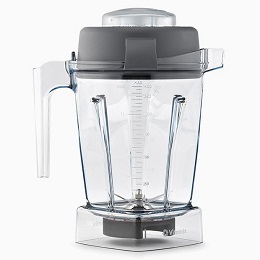 I guess the market is demanding enough for Vitamix to come up with this new and modern range of blenders. Luckily though, the quality in these new machines has not in any way been sacrificed. The containers in the Ascent range come with the brand new and patented Self-Detect™ technology. What this basically means is that the blender will recognize which size container it’s holding and will adjust its blend settings accordingly. This is achieved with wireless technology. The containers come in 3 different versions: 64 ounce low profile, 48 ounce and 48 ounce dry. Please note though that the Ascent series containers are not compatible with blenders in any of the other series. 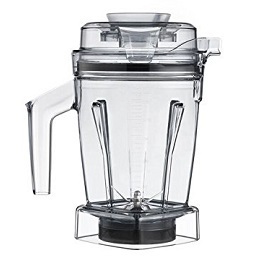 The Vitamix S-Series (aka Personal Series) are different from the Vitamix blenders we’ve been used to over the years in that the blades are not fixed to the containers. This allows you to use the 20oz on-the-go drinking container straight from the blender and start drinking your smoothie. If you don’t have a blender from the S-Series, you could just use this small jar as an extra drinking cup if you like. But honestly, while it may be a top quality drinking cup, there isn’t much justification paying more for this container if you’re really just using it as a drinking cup. There are cheaper drinking cups available. 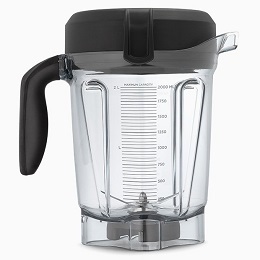 It’s worth pointing out that Vitamix has also released a personal cup and adapter that allows classic Vitamix blenders to blend directly with the personal cups from the S-Series. It’s no secret that Vitamix blenders are my all-time favorite blenders. Buying a high-end blender is a big investment, but I like them so much because of their excellent performance, durability and ease of use. And they are so easy to clean! Most people who buy a Vitamix blender will simply settle with the default container that comes with it. This is perfectly fine of course, but it can be useful to experiment with other types of Vitamix jars depending on what types of foods you would like to blend. Hopefully this guide gives you a good overview of available containers and what they can and cannot be used for. Vitamix Personal Cup and Adapter – Should You Buy It?